Good morning! 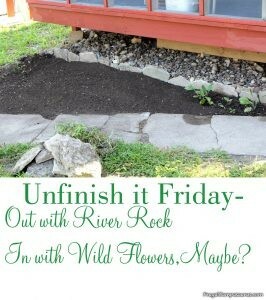 This week, instead of a Finish it Friday, we are having an Unfinished it Friday. The Summer Series, to help me fight procrastination and encourage me to actually finish projects, is actually helping, but this project will probably last all summer. It will definitely last all summer if the 95 plus temperatures, humidity and heat advisory stay with us. 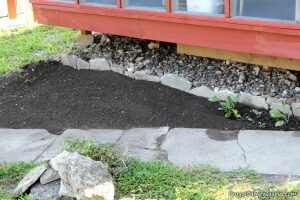 Since I weeded the garden last week, I decided to tear out the river rocks by the deck and plant wild flowers this week. Moving a few rocks? 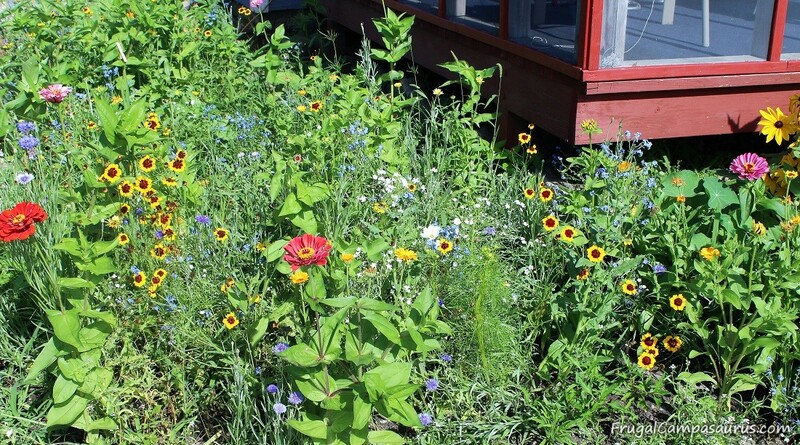 Planting wild flowers? Sounded quick to me. The husband said it would be a long, all summer project. Sometimes I hate it when he is right, though by now, I should know he usually is. 15 to 20 years ago (my, that sounds like a long time) we put river rock around 2 sides of the house. 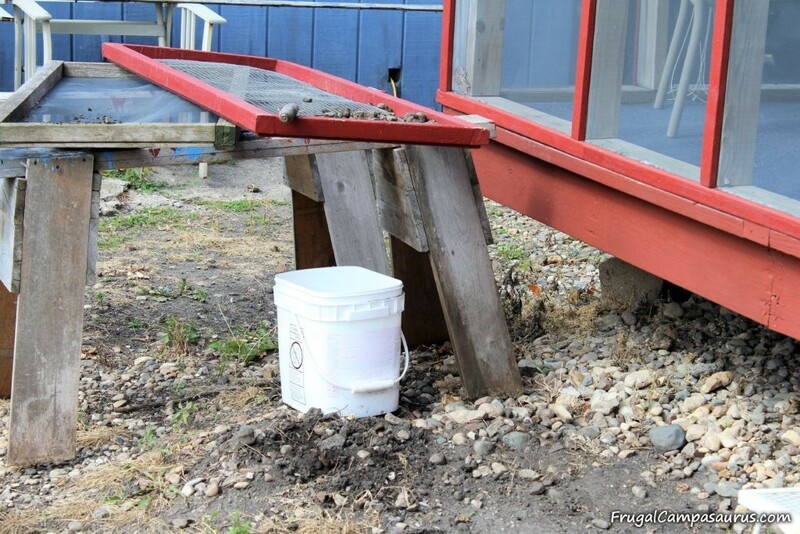 It works ok around the foundation. 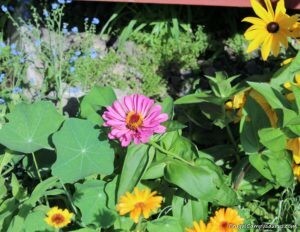 Since we don’t have gutters (very old house), the rain can fall on the river rock and not destroy my flowers. 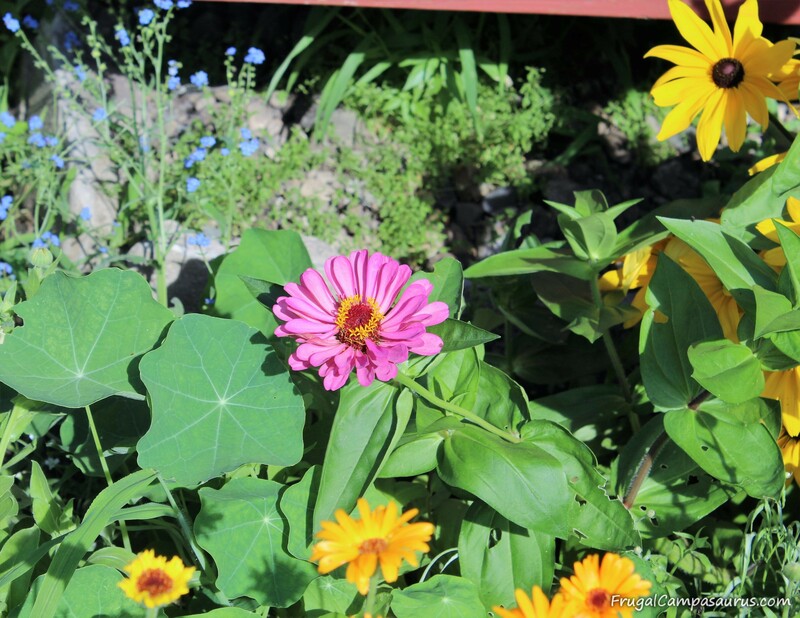 I do have a 12 inch border of flowers in front of the rock; it is very pretty, gives me plenty of cut flowers and is much less to weed. But, we had extra rocks. 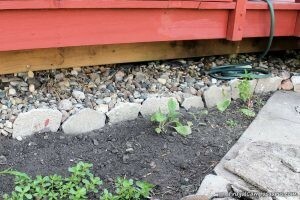 We thought all the extra rocks would make a nice walkway around the deck to the shed. We were wrong. The rocks never settled in and became a path. They always seemed uneven and loose to walk on. 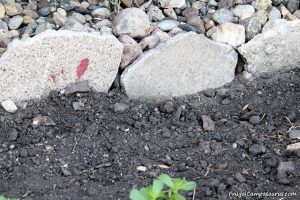 The weeds also thrived in the rocks,even though we placed the black weed barrier underneath when we put the rocks down. While the weeds seemed easier to pull, maybe they have shallower roots; I don’t need another area to weed. I have enough issues weeding the garden. We have discussed putting a patio around the deck. We have discussed another lower wooden deck over the rocks. Both involve money. And lots of work. 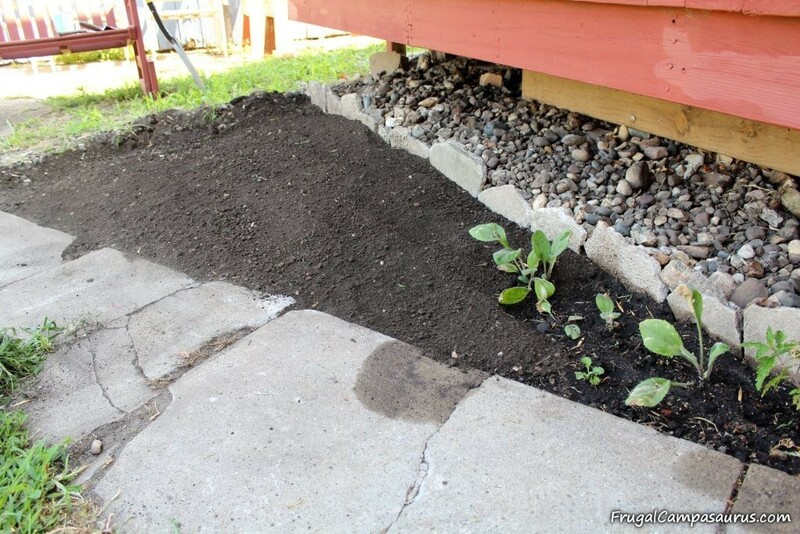 We are trying to be frugal and get rid of debt, so I was very interested when the husband said ‘could you plant flowers there?’ Flowers can be free! I can transplant many of my crowded flowers. I could also buy a few packets of wild flowers, maybe. 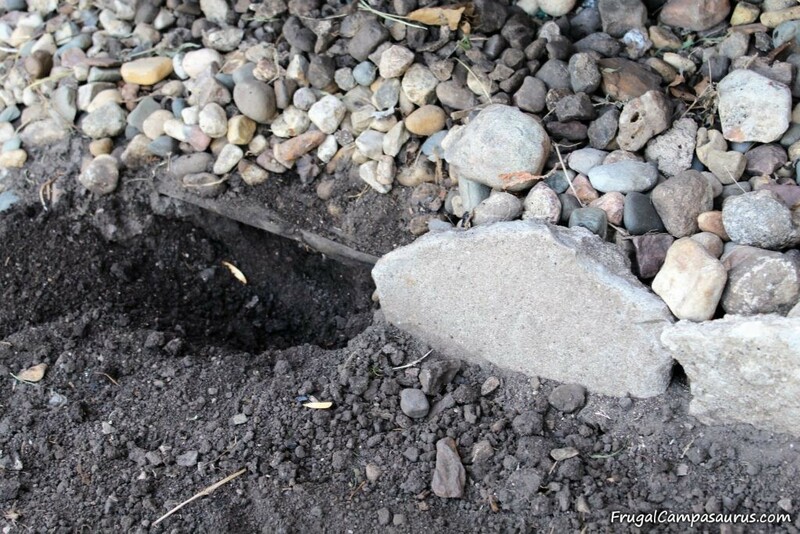 I’m putting a broken cement edging under the deck. Sounds cool, but really I’m just standing up pieces of old sidewalk we didn’t know what to do with. It is a great way to use the old sidewalk pieces, and it is free! 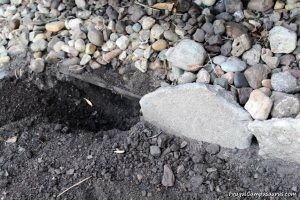 Burying it, on edge, about 6 inches deep helps keep the pieces sturdy. 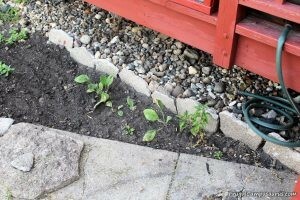 Hopefully, the edging will keep the river rock, that I left under the deck, out of the new flowers. 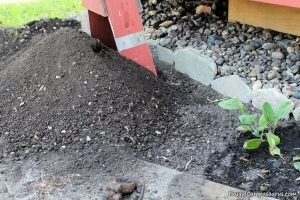 sifting rocks and dirtNot sure why I spent 1 day sifting dirt into a bucket, just to empty it 3 foot away. There's plenty of river rock under all those green weeds! 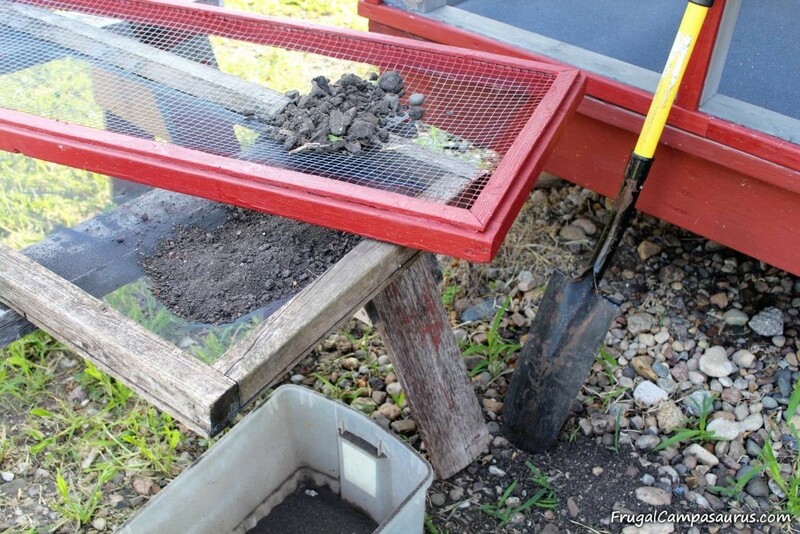 screens to sift rocksThe homemade sandbox cover makes a good dirt sifter! sawhorses and screenTime for a coffee break, especially when it's 90 degrees! I sifted the rocks from the dirt with our homemade sand box covers. 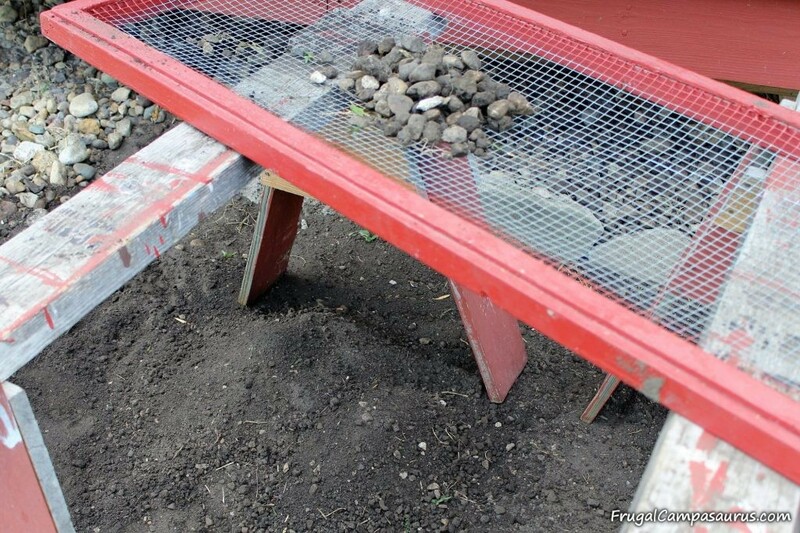 The hardware cloth screen sorts most of the rocks from the dirt. The first day, I also used a window screen to sort the small rocks. That did not last long, way too much work. 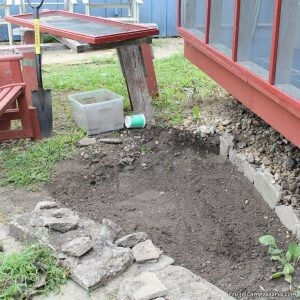 The first day, I also sifted the dirt into a bucket and would then move the full bucket 3 feet to dump it out where it belonged. 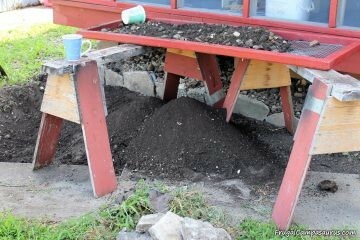 I think I needed more coffee when I set up the sawhorses and screens. Now, I just sift over where the dirt will end up. Way easier now. 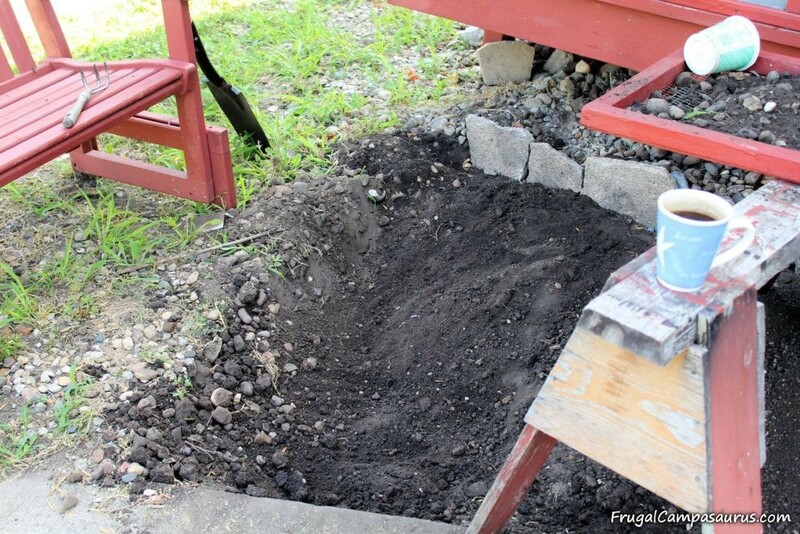 Every once in a while, there was a small breeze and I enjoyed plenty of coffee breaks while I sifted. I discovered that I could fill the screens with my free hand scoop (cottage cheese container) while seated on the bench. I love how it looks next to the deck, with the dirt leveled out and the river rocks gone. I started planting a few of my crowded flowers, even though I am only half way done sifting rocks. This is a very frugal Finish it Friday project, even though it will take a lot of work and many Fridays. Wow! 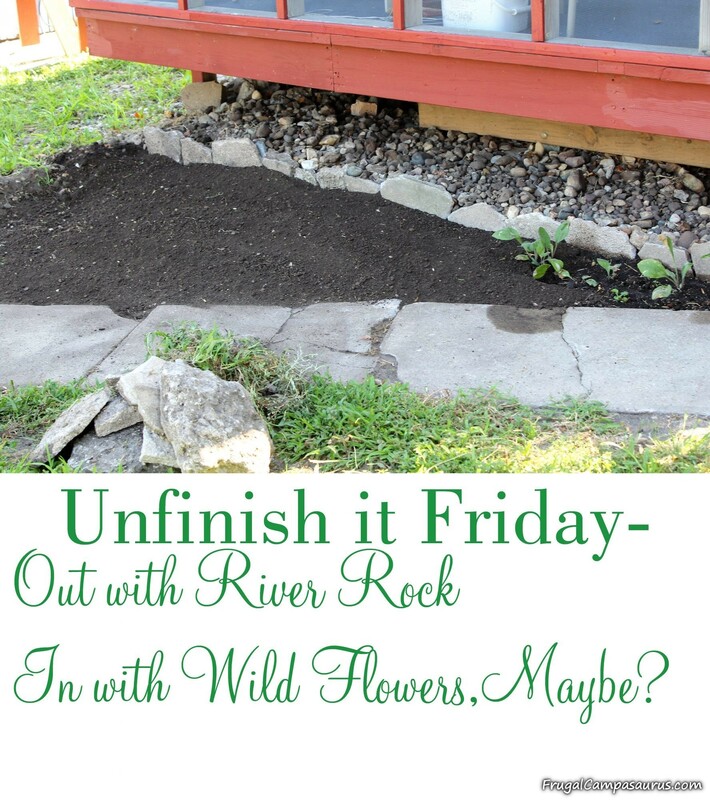 I am so excited about the river rocks being moved and the wildflowers growing around the deck! 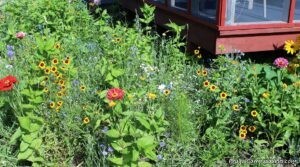 In addition to transplanting some of my crowded flowers to the new space, I also bought a few wildflower seed packets. I ended up spending about $10, but they are so pretty and packed in – I just love it! The sidewalk edging is doing a great job of holding the rock under the deck and out of the flowers, it is definitely worth all the sifting!